If he is to survive as Chelsea manager, Dan Levene says Jose Mourinho must publicly admit that he is human after all. At a club where the owner never speaks, a vote of confidence in the manager has to find another form. At Chelsea it came yesterday when, following the shambolic 1-3 home defeat to Southampton, John Terry was wheeled out to show support for boss Jose Mourinho. That the whole episode was conceived, scripted and released by those following the orders of Roman Abramovich was in no doubt. But it was notable that it was a luxury none of Mourinho's seven sacked predecessors at Chelsea (himself included, first time around) were ever afforded. Chelsea are in a tricky spot with the man at the helm right now. For much of what he said during the unprecedented scenes of his Saturday evening Stamford Bridge press conference will have rung true with Abramovich, as it surely did with journalists watching in slight disbelief, and fans reading in mild panic. He is the best manager Chelsea have ever had; he is the best one to get them out of this hole; and he is going nowhere – unless pushed by Abramovich towards the most expensive pay-off any football manager has ever received. Mourinho signed a new deal in the summer, worth £8.5m a year. That's a golden handshake of more than £30m (with certain caveats) if he is sacked tomorrow. And nothing if he resigns. For all his talk of love for the club that employs him, it seems crystal clear exactly why he won't be falling on his sword now, or at any point henceforth. The vote of confidence, backed up by briefing that the club board had met and decided to back him, carries only the same weight these things ever do. There is a reason why these pronouncements are treated with such cynicism by those who know the game. They are a statement of intent, a show of a support – and, crucially, a warning as to future conduct. Mourinho is safe for now, and for the international break. He will have time to sort out his head (he said on Saturday he would visit his unwell father in Portugal), his tactics, and his team (with a nod to youngster Ruben Loftus-Cheek clearly sending a broadside at Nemanja Matic and Cesc Fabregas). But what would a home defeat to Aston Villa bring, should it come? And how about a poor result at Dynamo Kiev, which would further burden Chelsea in a Champions League group judged by most as a cakewalk? Mourinho is already setting out his stall for these eventualities. He knows that what has caused most job insecurity to his predecessors is the risk that Champions League qualification may slip from grasp. That was the reason for the sackings of Luiz Felipe Scolari, Andre Villas-Boas and Roberto Di Matteo. So by making it clear that he sees fourth place as an achievable feat, come January or February, he is asking for time to prove himself and his team. And, should even that be achieved, he is not out of shark infested waters. Remember Carlo Ancelotti – sacked 12 months after winning the Premier League and FA Cup double, essentially for a blip in the season. 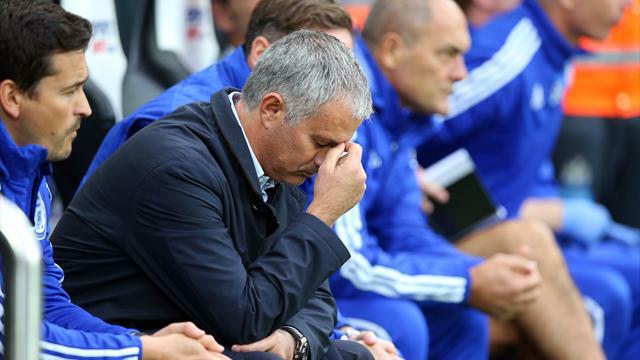 So what does Mourinho really need to do to save his tenure with the club he claims to support? One who has bore his wrath told me he needs to spend less time talking, and more listening. The charge is that he surrounds himself with 'yes' men, and those who demur pay the price. Eva Carneiro, for instance, is not the reason for the current problem – just a symptom of the wider issue. Mourinho's assistants are created in his own image – they must blithely follow; or, as in the case of Andre Villas-Boas and Brendan Rodgers – head out on their own with some failing tribute act. Mourinho took this ticket on the basis that he would have sole coaching direction over the team. But what he really needs now, it is suggested, is someone to challenge that – to tell him where his ideas slide into the impractical, the unwise, the lunatic. Mourinho has built a reputation in the game as the ultimate dictator, who has achieved success by sticking religiously to a script he knows works. Now it is not working, he may need to loosen his grip on the reins a little to ensure he is not thrown off the horse (little, or otherwise). Is he ready to do that? Ultimately, it may decide his fate at Chelsea. Dan Levene covers all things Chelsea for Eurosport.com.